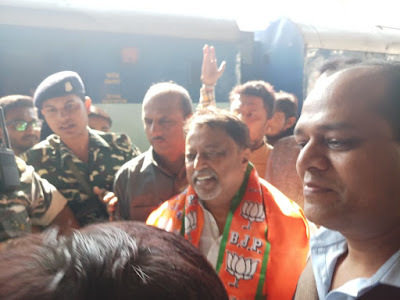 Jalpaiguri: A stage where Mukul Roy was to address a rally in Jalpaiguri was ransacked on Saturday, but the BJP leader went ahead with the meeting that his party colleagues claimed Trinamul activists had tried to disrupt. The incident in Mainaguri's Jorepakhri sparked clashes between Trinamul and BJP supporters on the third day of Roy's visit to north Bengal. The trip is his first since joining the BJP last month. Debasis Chakraborty, the Jalpaiguri BJP chief, alleged that Trinamul supporters ransacked the dais before Roy arrived and also damaged many vehicles. Trinamul denied the charges and accused the BJP of organising meetings without the administration's permission. "BJP leaders unleashed violence with the help of miscreants," Trinamul district chief Sourav Chakraborty said. Addressing a gathering of a few hundreds near the vandalised stage later, Roy claimed an "overwhelming response". "They (the people) protested against the ruling party. This is a sign that a change in power is inevitable." BJP district chief Chakraborty said the aim of the attackers was to thwart the meeting. "They wanted to get the meeting cancelled but failed and went back after our supporters protested." Shibshankar Dutta, a member of the Trinamul-run Mainaguri Panchayat Samiti and his supporters, later joined the BJP in the presence of Roy and party MP Roopa Ganguly. A stage where Mukul Roy was to address a rally in Jalpaiguri was ransacked on Saturday, but the BJP leader went ahead with the meeting that his party colleagues claimed Trinamul activists had tried to disrupt.